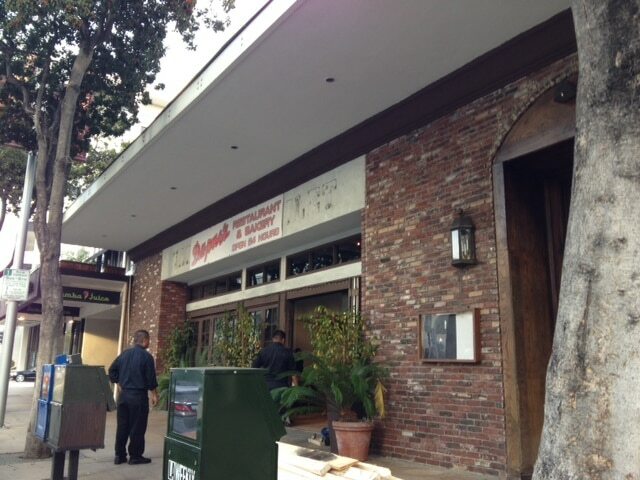 Hamburger Hamlet closes Pasadena location and set to open as Du-par’s. The signage and display cases are going in as of this afternoon. We will ask about outdoor seating which would be a welcomed addition in the area. The current banners shows that this location will be open 24 hours! No other restaurant is opened 24 hours in this area. Biff Naylor owner if Du-pars is on hand to welcome Pasadena to the newest location taking over where Hamburger Hamlet has served for some 46 years! Pasadena Now – Eddie Rivera sites with Biff Naylor to gather some details on how the transition from Hamburger Hamlet took place. Just to think that the space could have possibly been left vacant. The Pasadena Hamburger Hamlet has struggled with this location for the past several years, even scoring poorly with the Pasadena Health Department. One good note is that the entire Hamburger Hamlet staff will stay on to work at the new Du-pars location. Very little will be changed except for the name, even the phone number is staying the same. Training will take place and the location will open as Du-Pars.